As if these obvious chemtrails can be explained away as normal contrails! The authors themselves tell the true story about how such a fabricated story ever makes it to print much less to a peer-reviewed open access environmental research journal. For instance Mick West runs a website known as Metabunk.org which is dedicated to falsely debunking anything that is probably true and genuinely conspiratorial in nature. The website is a complete joke and should not be taken seriously for even a moment … about any topic whatsoever, even when they may be onto to something. Ken Caldiera on the other hand is an atmospheric scientist who actually pioneered the science of chemical geoengineering. And yet he is one of the principal authors of the bogus study. He has in fact been a zealous advocate of weather modification and climate engineering throughout his academic and research career. How he deigns to present himself as a chemtrail denier is as ludicrous as it is inexplicable. For the uninitiated, the comment section at the link provided at the bottom of the article presents many interesting comments from everyday folks who only use their common sense and faculty of reason. The people are much more intelligent that the supposed scientists who participated in this absurd and insulting study. They are even more aware and better informed than some of the best alternative news websites on the Internet. Why SOTT ever posted such a piece of government propaganda is difficult to comprehend. N.B. The following link offers a litany of mainstream acknowledgements of geoengineering and admissions of scientific/academic pursuits in all the related disciplines. WASHINGTON – You’ve seen the contrails behind those high-flying jets – sometimes making crisscrossing patterns in the sky – above your home, your town, your city. And you’ve heard the rumors. The government is spraying toxic chemicals, gene-altering concoctions, testing weapons of war. But the first peer-reviewed study published on these mysterious “chemtrails,” as they are often called, found they are not the result of governments covertly conducting experiments on the public. They’re just plain old water vapor. Rather than “chemtrails,” say the researchers, they are actually “contrails,” which is short for condensation that produces water vapor that freezes around aerosols in the aircraft exhaust. To find out what was going on, the team interviewed 77 scientists who should know what they’re talking about – they were either atmospheric chemists who specialize in condensation trails, or geochemists working on atmospheric deposition of dust and pollution. Out of the group, 76 of the 77 experts said they hadn’t come across evidence of secret, large-scale spraying programs. The researchers were shown four images commonly circulated as “chemtrails,” and 100 percent of them said they were just ordinary contrails – and they provided peer-reviewed citations to back up their claims. 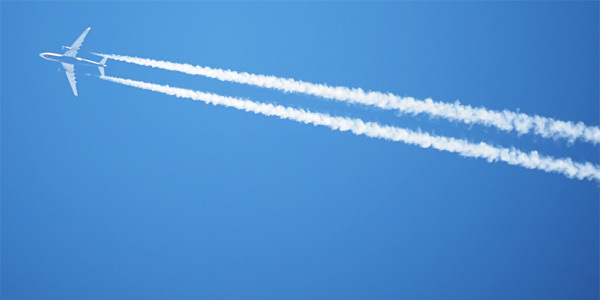 The researchers also suggested that contrails are more common these days simply because air travel is becoming more regular. “Despite the persistence of erroneous theories about atmospheric chemical spraying programs, until now there were no peer-reviewed academic studies showing that what some people think are ‘chemtrails’ are just ordinary contrails, which are becoming more abundant as air travel expands,” said one of the researchers, Ken Caldeira from the Carnegie Institution for Science. In other words, nothing to see up here. Of course, there’s a climate change tie-in. There’s always a climate-change link. “Also, it is possible that climate change is causing contrails to persist for longer periods than they used to,” said Caldeira. 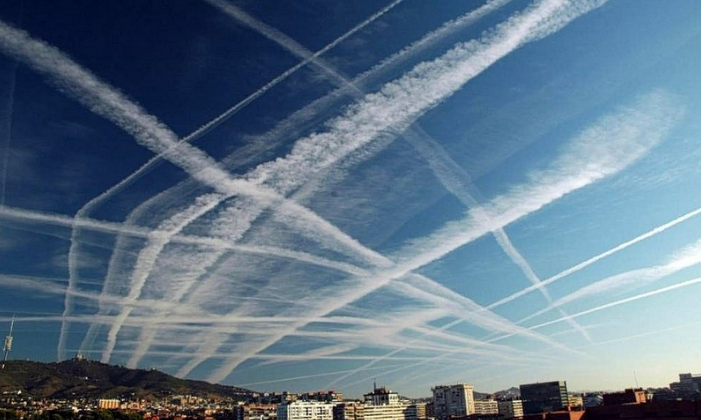 The team admits that their research probably won’t sway the opinion of anyone who already believes in “chemtrails,” but they hope that by providing a peer-reviewed study on the subject, people new to the topic will find something objective when doing their research. The research has been published in Environmental Research Letters.